The renowned Canadian Rapper Drake's fifth studio album Scorpion was released on June 29, 2018. Scorpion is a double album and there are 25 tracks in total. Its "A side" is primarily a hip hop album, whilst its "B side" has been described as R&B and pop. On the July 14, 2018 Billboard Hot 100 chart, all 25 songs were listed, beating the record of 22 entries by his previous release More Life. Now Scorpion is available on both Spotify and Apple Music. 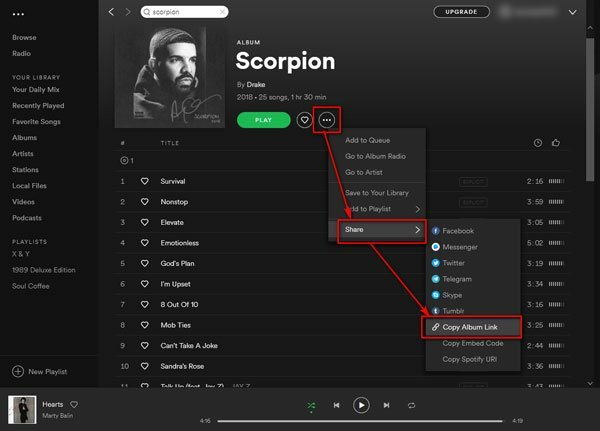 In this article, we will show you how to download Scorpion album as MP3 in high quality from Spotify with Spotify Music Converter or from Apple Music with Apple Music Converter. If you are a rapper lover, you shouldn't miss the the Canadian Rapper Drake. Drake's fourth studio album More Life had got great reputation, and recently his fifth studio album Scorpion has been released. Scorpion is a double album with 25 songs about 90 minutes in total. Scorpion soon got popular after its release and on July 14, all the 25 songs were list on 2018 Billboard Hot 100 chart. According to Billboard, Scorpion album broke the US streaming record with 745.92 million streams in its first week and pulled in over 1 billion streams globally in its first week. Meanwhile, "Drake Scorpion MP3 Download" also became a hot keyword in Google search. Scorpion was initially released on Apple Music and iTunes, and now it's also available on Spotify and some other streaming music services. Below is the full list of all 25 tracks in Scorpion album. You can search the album on some torrent websites or network drives, but it may be illegal in your country or unsafe to download from unauthorized websites. You can purchase the album on iTunes Store and get M4A files to play on your iPod, iPhone, Sony Walkman or MP3 players. 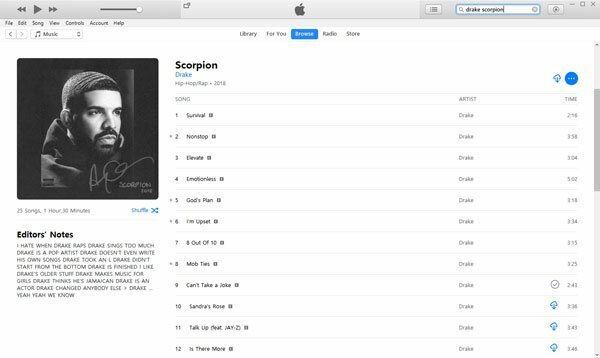 If you have subscribed Apple Music, you can download the entire Scorpion album and enjoy them on Apple Music supported devices. However, if you want to enjoy Scorpion and other Apple Music songs on your iPod Nano/Shuffle or MP3 players, you can use Apple Music Converter to convert the album as MP3. If you are using Spotify, with either free or premium account, you can download Scorpion album as MP3 with Spotify Music Converter. 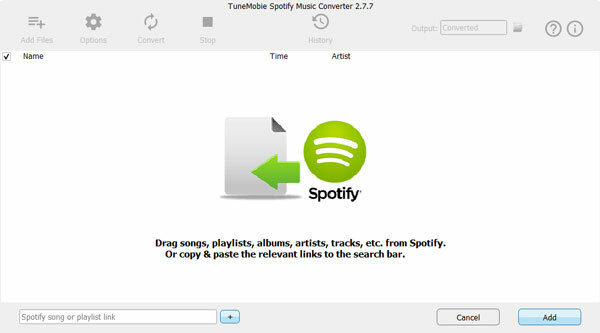 Spotify Music Converter is a dedicated Spotify music downloader which can help you download Spotify songs, albums or playlists as MP3, M4A, WAV or FLAC. All the music information will be included in the output files. Spotify Music Converter allows you to Spotify songs with either Spotify Free or Spotify Premium. 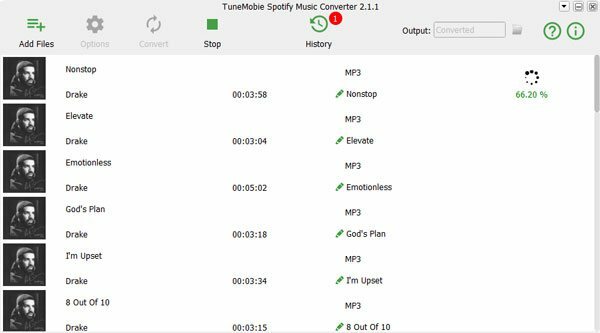 Spotify Music Converter is very intuitive and easy-to-use, it's your best helper to download Drake's Scorpion album as MP3 in only a few clicks. Spotify Music Converter is available for both Windows and Mac OS X, and fully compatible with latest Windows 10 and macOS Mojave. Now you can get the free trial version to have a try. Below are the steps to use Spotify Music Converter to download Scorpion as MP3 files in 320kbps high quality. Step 1: launch Spotify Music Converter and Spotify program will be automatically launched as well. Click "Add Files" button and you can see a blank area in the bottom left where you can paste the "Scorpion" album link. Now go to Spotify and search "Scorpion", click the best result to learn more details of the album. Then you can click "..." button and move to "Share" and click "Copy Album Link" to get the album link of Scorpion. Now, go back to Spotify Music Converter and paste the album link in the blank area and click Add button. Step 2: All 25 songs in Scorpion album will be listed in checked status. If necessary, you can uncheck any songs in the album. Then click "Add" button to add the songs to conversion list. Step 3: By default, 320kbps MP3 will be used as output format. If necessary, you can click Options button to change output format. Step 4: Now, click Convert button to start download Drake's Scorpion album as MP3. Downloaded songs will be added to History list, you can get the output MP3 files there. Downloading Drake's Scorpion album from Spotify is an easy job, and downloading Scorpion album from Apple Music as MP3 is also as easy as a breeze. Apple Music Converter is a dedicated Apple Music DRM removal program which can help you remove DRM protection from Apple Music songs downloaded in iTunes library and convert them to plain MP3, M4A, AIFF, etc. with ID3 tags retained. It's the best helper for Apple Music users to download Scorpion album and convert them to MP3/M4A. Apple Music Converter supports latest Windows 10 and macOS Mojave and performs 16X faster conversion speed on Windows and Mac 10.9 - 10.12. Get the free trial version to have a try now. 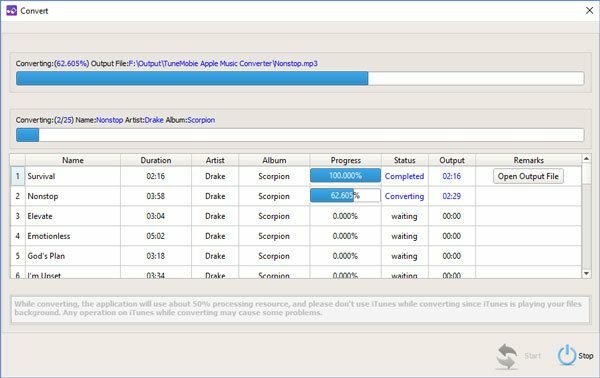 Below are the steps to use Apple Music Converter and iTunes to download Scorpion album and convert to 320kbps high-quality MP3. Step 1: Open iTunes, enter Drake Scorpion in search box in the upper right. Choose "All Apple Music" if you haven't added this album into iTunes library. You will get the result of the album. Click Scorpion album to learn more details. Click "Add" button first then click the Cloud mark to download entire album to your iTunes library. When the entire Scorpion album is downloaded, please exit iTunes first. Step 2: Launch Apple Music Converter and iTunes will be automatically launched as well. iTunes library will be loaded and displayed as playlists in the left panel. Scorpion album can be found in Library or Music playlist. Step 3: Click Library or Music playlist and search "Scorpion" in the built-in search box and the 25 songs in Scorpion album will be listed as search result. In the search result, tick the top checkbox to select all 25 songs. 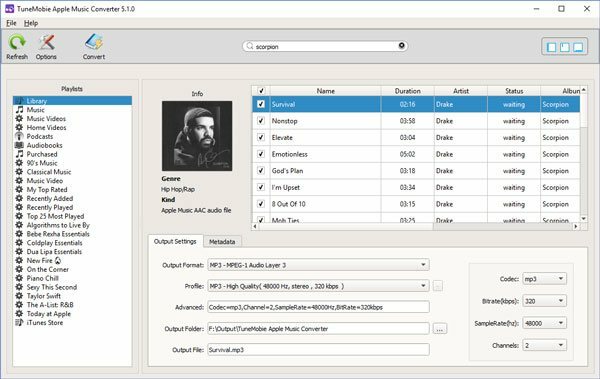 Step 4: Choose MP3 or M4A in the output format list and set profile to select output audio quality. If necessary, you can click Options button to adjust conversion speed and set output file name. Step 5: Click Convert button and the Scorpion album will be converted into MP3/M4A as you like. After conversion, click "Open Output File" button to get the Scorpion album in MP3/M4A format. Either you use Apple Music or Spotify, there will be a good solution for you to download Drake's Scorpion album as MP3 or M4A. Of course, the guide also applies to any other albums in your favorite list. Now you have got the Scorpion album in MP3 or M4A format, you can transfer them to your Sony Walkman or MP3 players, or add to iTunes library and sync to your iPod Nano, iPod Shuffle, iPod Touch, iPhone or iPad, and enjoy them without any limitation.